Though this "voltage divider formula" may be found in any number of electronics reference books, your students need to understand how to algebraically manipulate the given formulae to arrive at this one. Follow-up question: are the two ratios' equality a coincidence? Explain your answer. 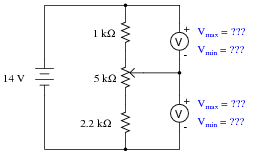 An important aspect of this question is for students to observe the identical ratios (voltage versus resistance), and determine whether or not these ratios are equal by chance or equal by necessity. Ask your students, "What kind of evidence would prove these ratios were merely equal by chance?" Setting mathematics aside and viewing this circuit from a purely experimental point of view, ask your students what data could possibly prove these ratios to be equal by chance in this particular case? Hint: it would only take a single example to prove this! It's all the same circuit, just different ways of drawing it! New students often experience difficulty with problems such as this, where ground connections are located in ßtrange" places. The alternate diagram may be helpful in this case. The alumina/electrolyte mixture is a molten bath of chemicals, lighter than pure aluminum itself. Molecules of pure aluminum precipitate out of this mix and settle at the bottom of the "pot" where the molten metal is periodically pumped out for further refining and processing. Fresh alumina powder is periodically dropped into the top of the pot to replenish what is converted into aluminum metal. 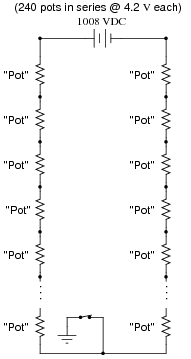 Follow-up question: assuming each of the pots acts exactly like a large resistor (which is not entirely true, incidentally), what is the resistance of each pot if the total "potline" current is 150 kA at 4.2 volts drop per pot? I (Tony Kuphaldt) worked for over six years at an aluminum smelter in northwest Washington state (United States of America), where part of my job as an electronics technician was to maintain the measurement and control instrumentation for three such "potlines." Very interesting work. The magnetic field emanating from the busbars conducting the 150 kA of current was strong enough to hold a screwdriver vertical, if you let it stand on the palm of your hand, assuming your hand was just a few feet away from the horizontal bus and even with its centerline! In your discussion, it is quite possible that someone will ask, "Why not eliminate the ground entirely, and leave the whole potline floating? Then there would be no shock hazard from a single-point contact, would there?" The answer to this (very good) question is that accidental groundings are impossible to prevent, and so by not having a firm (galvanic) ground connection in the circuit, no point in that circuit will have a predictable voltage with respect to earth ground. This lack of predictability is a worse situation than having known dangerous voltages at certain points in a grounded system. 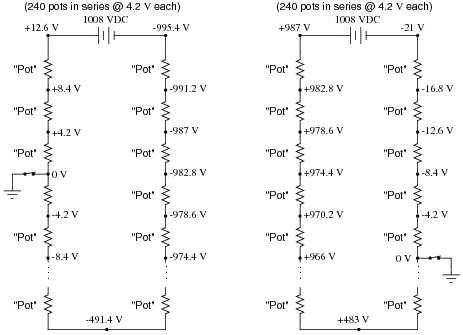 Ask your students to describe the "with R5 / without R5" voltage values in terms of either increase or decrease. A general pattern should be immediately evident when this is done. 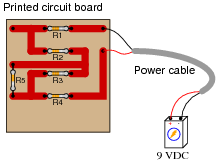 Suppose we have such a series circuit with a source voltage of 15 volts, and resistor values of R1 = 1 kW and R2 = 8.1 kW. Algebraically manipulate this formula to solve for R3 in terms of all the other variables, then determine the necessary resistance value of R3 to obtain a 0.2 volt drop across resistor R1. 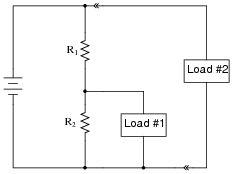 When the load is connected across R2, R2's voltage will ßag" (decrease) while R1's voltage will rise (increase). Algebraically manipulate these four equations so as to solve for m in each case. This will yield equations telling you where to set each potentiometer to obtain a desired output voltage given the input voltage and all resistance values (m = �). 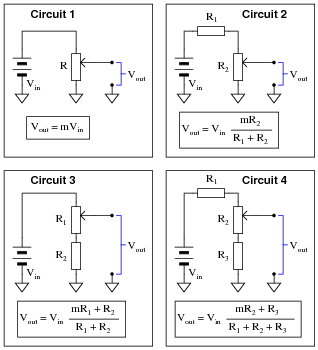 Students will have to re-consider (and possible re-draw) the circuit for each loading condition, which is one of the major points of this question. 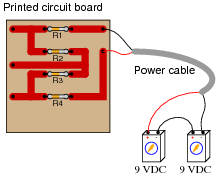 The fact that a circuit can "change" just by throwing a switch is an important concept for electronics students to grasp. Another concept employed in this question is that of voltages specified at single points with an implied reference of ground. 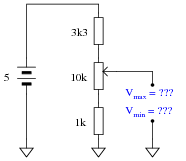 Note to students how each voltage was simply referenced by a single letter, either A or B. Of course there is no such thing as voltage at a single point in any circuit, so we need another point to reference, and that point is ground. 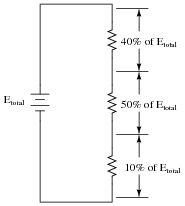 This is very commonly seen in electronic circuits of all types, and is a good thing to be exposed to early on in one's electronics education. Also, it might be good to ask your students to show the equivalent circuit (made up entirely of fixed resistors) that they drew in route to solving for total resistance and output voltage. Encourage them to take this step if they have not already, for although it does involve ëxtra" work, it helps greatly in keeping track of the series-parallel relationships and all calculated circuit values. Note that the two 5 kW potentiometers are set to their 80% positions (m = 0.8), while the 100 kW potentiometer is set exactly to mid-position (50%, or m = 0.5). 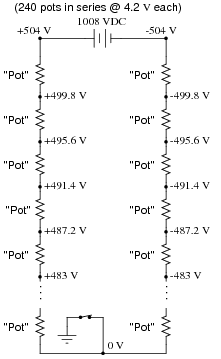 Note that the upper 5 kW potentiometer is set to its 20% position (m = 0.2), while the lower 5 kW potentiometer is set to its 90% position (m = 0.9), and the 100 kW potentiometer is set to its 40% position (m = 0.4). The follow-up question is intended to get students to come up with their own version of Occam's Razor: the principle that the simplest explanation for an observed phenomenon is probably the correct one. 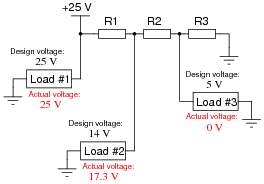 Follow-up question: note that the voltage at load #2 is not fully 25 volts. What does this indicate about the nature of R1's failure? Be as specific as you can in your answer. Explain that not all ßhorted" failures are "hard" in the sense of being direct metal-to-metal wire connections. Quite often, components will fail shorted in a ßofter" sense, meaning they still have some non-trivial amount of electrical resistance. Use this question as an opportunity to discuss troubleshooting strategies with your students. A helpful hint in dealing with this kind of problem is to categorize each load voltage as either being greater or less than normal. Forget the negative signs here: we're dealing strictly with absolute values (in other words, -25 volts is a "greater" voltage than -20 volts). Once each load voltage has been categorized thusly, it is possible to isolate the location and nature of the fault without having to deal with numbers at all! R = 1 kW. The 470 W resistor will fare well even with a (low) power dissipation rating of 1/8 watt, though the 1 kW resistor will need to be rated in excess of 1/4 watt. 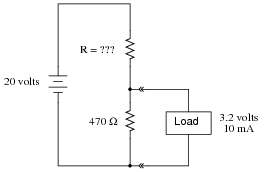 R = 264 W. The 330 W resistor must have a power dissipation rating of at least 3 watts, while the 264 W resistor will fare well even with a (low) power dissipation rating of 1/8 watt. R1 = 750 W and R2 = 6 kW. 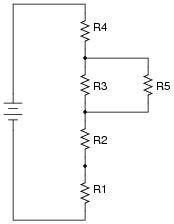 [1/8] watt resistors are perfectly adequate to handle the dissipations in this circuit. 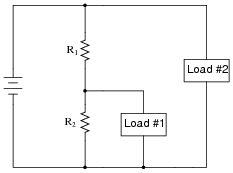 Ideally, the first load's voltage and current will remain unaffected by the connection of load #2 to the circuit. In reality, there will inevitably be a slight sag in the load voltage though, because the voltage source is bound to have some internal resistance. 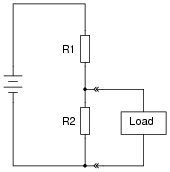 Ideally, the first load's voltage and current will remain unaffected by any fault within load #2. 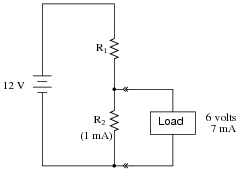 However, in the event of a short-circuit in load #2, the source voltage will almost surely decrease due to its own internal resistance. In fact, it would not be surprising if the circuit voltage decreased almost to zero volts, if it is a "hard" short in load #2! While it is important for students to realize that the second load constitutes a separate parallel branch in the circuit and therefore (ideally) has no effect on the rest of the circuit, it is crucial for them to understand that such an ideal condition is rare in the real world. When "hard" short-circuits are involved, even small internal source resistances become extremely significant. R1 = 545.5 W, rated for at least 148.5 mW dissipation ([1/4] watt recommended). R2 = 933.3 W, [1/8] watt power dissipation is more than adequate. R3 = 3.2 k W, [1/8] watt power dissipation is more than adequate. Old vacuum-tube based electronic circuits often required several different voltage levels for proper operation. An easy way to obtain these different power supply voltages was to take a single, high-voltage power supply circuit and "divide" the total voltage into smaller divisions. 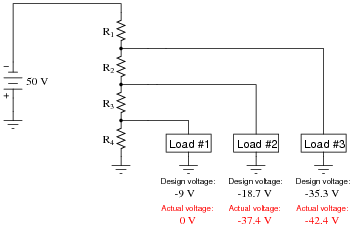 These voltage divider circuits also made provision for a small amount of "wasted" current through the divider called a bleeder current, designed to discharge the high voltage output of the power supply quickly when it was turned off. 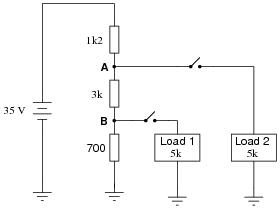 Follow-up question: how would the various output voltages (plate, screen, preamp, etc.) be affected if the bleeder resistor were to fail open? You don't need to calculate anything, but just give a qualitative answer. 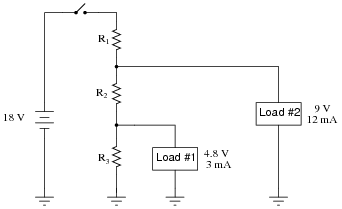 Show how a single resistor could be connected to this voltmeter to extend its range to 0 to 50 volts. 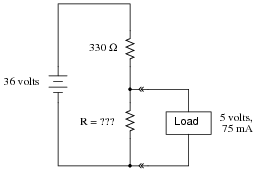 Calculate the resistance of this "range" resistor, as well as its necessary power dissipation rating.